By downloading Port of Portland photos, you are agreeing not to use it for outside commercial use. PORTLAND, Ore., January 24, 2019 – Portaurora, a new permanent art piece designed by Sticky Co., a Portland- and Amsterdam-based artist team, transforms the airport experience into something magical. 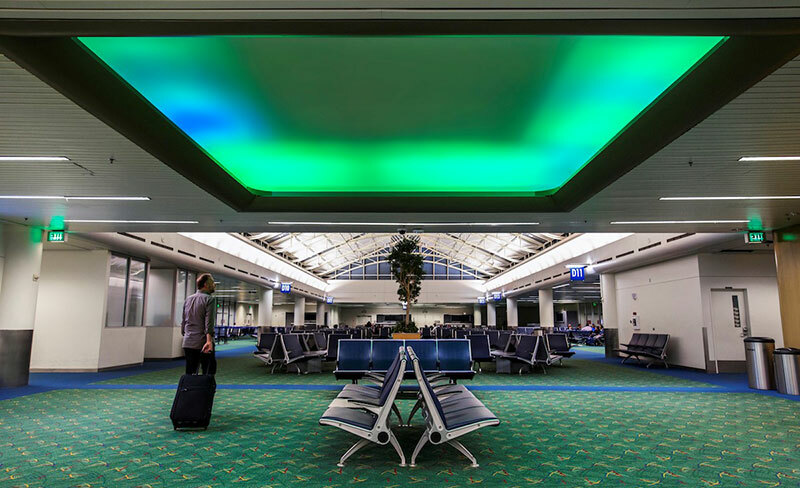 As travelers at Portland International Airport (PDX) make their way through concourse D to reach their gates, they enter the interactive Portaurora installation, which responds to each traveler's presence with a wash of colors and sound inspired by the northern lights. Travelers at PDX have long enjoyed the best of local restaurants and shops. The airport even has a free movie theater showing locally made films. But until recently, this stretch of concourse D lacked an element that distinguished it from other terminals around the country. The Port of Portland, which owns and operates the airport, commissioned Sticky Co. to create a work that would transform travelers’ experiences as they move through the concourse. As a new permanent installation, Portaurora joins other signature features that make PDX a favorite airport. “We want the experience travelers have within the airport to reflect what's special about our city and our region,” says Wendy Given, art coordinator for Port of Portland. About Sticky Co.: Sticky Co. is a Portland- and Amsterdam-based artist team that makes memorable multimedia for transit hubs, museums, festivals, sports teams, universities, and other clients. Their custom creative projects span technologies and genres. About the Port of Portland: Established in 1891 by the Oregon Legislature, the Port of Portland today owns three airports (Portland International, Hillsboro, and Troutdale), four marine terminals, and five business parks. Its mission is to enhance the region’s economy and quality of life by providing efficient cargo and air passenger access to national and global markets, and by promoting industrial development. Our Media Relations Team strives to provide what you need in a timely manner. You can reach our on-call Media Relations representative 24/7 through the pager number below. During regular business hours feel free to contact the appropriate media relations contact who can assist you with visits and any interview or information requests. Read features in our online publication, Portside, get updates on PDX Art & Music. Stay current with our News Releases.